I keep all rights to those circuits myself. You may freely build those circuits to yourself and your friends, but commercial use of those circuits is not allowed. NOTE: Those circuits are old designs from time when I was not so good in electronics than I am now. All of the designs are not very good and I would do those circuits today differenly. For example the first DAC circuit is not very accururate and R2R construction would give much better performance. JDAC and CENT_DAC are both simple Digital to Analogue converter to use with your IBM PC/AT or compatible. Those circuit are connected to Centronics parallel port and does not affect the normal port usage in any way. The circuits are transparent to computer, so it is not possible to program to see if those devices are connected or not. JDAC and CENT_DAC are designed to give your computer good quality audio output without great expenses. JDAC and CENT_DAC are designed to use with programs which supports them. Those programs include game programs which support Covox Speech Thing and some great Finnish shareware programs like B's Wave Center and Scream Tracker. JDAC is a simple, inexpensive and easy to build. The sound quality is good, but not best possible. Enough good circuit for most of cases. The output level is about 0.4V pp. It can be altered by changing the value of R9. Higher resistance in R9 means higher output voltage. If R9 is left open, the output level is about 5V pp. The resistor values in the schematic above might seem to be a bit strange, but they were the nearest standard values I could get form my local electronics show. The accurate values for resistors would be 5k, 10k, 20k, 40k, 80k, 160k, 320k and 640k ohms. 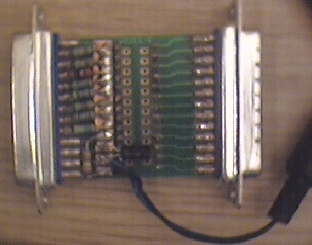 On the pictures below you can see one version of parallel port D/A converter which I built to a RS-232 jumper box. This box was an inexpensive way to get nice looking case and connectors already soldered to PCB in one packet. CENT_DAC is more accurate circuit. It uses AD7524 type industry standard Digital to Analog Converter chip. I used AD7524 from Maxim. The circuit need external +5V (+/- 5%) well regulated power supply with current rating of about 20mA. The output level is about 0.4V pp. MF4FILTER is a variable low pass filter. It is designed to cut out the high frequency components in the D/A converter output signal. The result is more clear and natural sound. This circuit is highly recommended if you output sampled sounds with low sample rates. The cutoff frequency is can be set from about 3kHz to about 15kHz using potentiometer P1. MF4FILTER is build around National Semiconductor MF4CN-50 chip. The chip is a variable switched capacitor 4-stage Butterworth low pass filter with 24dB/oct attenuation. Texas Instruments also makes compatible chip with code TLC04/MF4A-50. Other components in the circuit are for setting the chips clock frequency and for setting the audio bias voltage. There are also LC-filer in the output to cut out the clock frequency from output signal. MF4FILTER needs regulated 9-14V power supply with current rating of about 30mA (or more). JDAC and CENT_DAC can be used with or without MF4FILTER. You can easily use JDAC and CENT_DAC as an output device to the sampled sounds in your own programs. You simply output the sample data in the correct rate to Centronics port data lines. The printer does not care about that data because you keep STROBE line in inactivated state all the time. Simple and easy. The sampled data must be 8 bit and audio 0V set to value 128. There is a driver for using DAC connected to parallel port as Windows 3.1 sound output device for playing back sample and sound effects. The driver was originally written for Covox Speech Thing, but works nicely with this compatible circuit. I have not tested myself the drivers with Win95/98, but some other have tested vith varying results. For some people the Windows driver above works nicely, but for some people the sound quality is very bad (many breaks in sound) or the driver does not seem to work at all. Select Have Disk and browse to the directory you unzipped all the files for the drivers in. Select the oemsetup.inf file and click ok.
Then you are done and you can restart the machine. The next time you login and want to use your sound card go through the configuration listed at the bottom of this page. Playback: Preferred Device to be "Speech Thing Waveform Output"
Then select the check box at the bottom that indicates to only use the preferred device. Because JDAC and CENT_DAC use the same data lines as printer, it is not possible to print file and output sound at the same time. When printing files irrating sound is heard from JDAC or CENT_DAC audio output. NOTE: Please contact me only on hardware related. I am not interrested in debugging any problems which you might have with the drivers which I have not written myself and I have not tested for a long time. Please do not send questions where to get components for this project, because i can't help you with this if you happen to live in any other country than Finland. I don't consider myself as responsible for anything considering the circuits or this text. If you manage somehow damage your computer or anything else with those circuits, it is your fault. National Semiconductor MF4 data sheets. Covox Speech Thing is a registered trade mark of Covox INC.
B's Wave Center is a shareware program made by Arttu Kontkanen. Scream Tracker is a shareware program made by Sami Tammilehto.